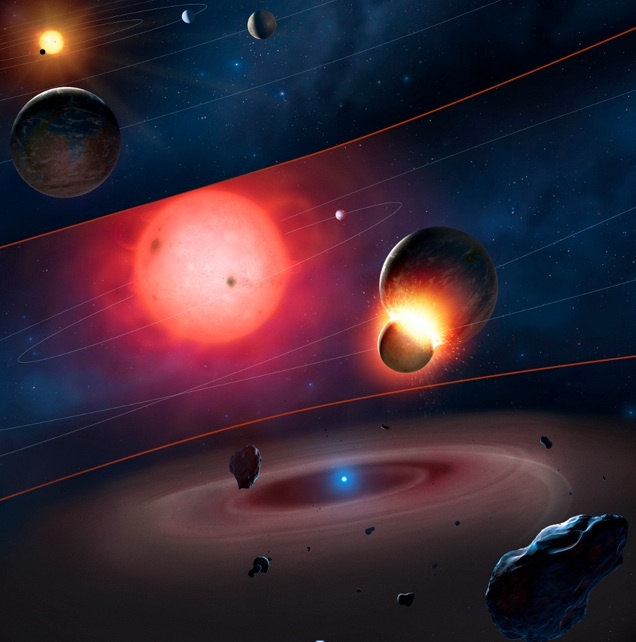 The typical place to find dusty debris disks is orbiting around ordinary stars like the Sun, or younger stars that are in the process of forming terrestrial planets. But some dusty disks that you might spot in Disk Detective surround tiny, exotic dead stars called white dwarfs. Most ordinary stars like the Sun will end their lives by bloating up into red giants. The cores of the red giant stars are balls of mostly carbon and oxygen, the spent fuel of the nuclear burning that powers the star. Red giant stars blow away much of their mass in winds, and eventually become stripped down to naked cores. It is called a white dwarf when those winds are done blowing, and there is nothing left of the star but its carbon and oxygen core covered with a very thin layer of hydrogen gas. White dwarfs are just a bit larger than the Earth in diameter, though they generally weigh around three-quarters as much as the Sun! For a long time people thought that the process of stellar evolution into white dwarfs meant certain death for any planetary systems that might orbit the original stars. Indeed, inner terrestrial planets may indeed be destroyed by this process. But large asteroids, giant planets, and potentially even icy bodies might survive if they are big enough and far enough away to weather the drastic changes that a star goes through. Astronomers are now studying the nearest white dwarfs for signatures of these possible surviving planets. One telltale signature is the presence of dust orbiting a white dwarf. If we look at a white dwarf in infrared light, with a telescope like the WISE telescope, a dusty white dwarf will be brighter there than at shorter wavelengths, just like the targets of Disk Detective. 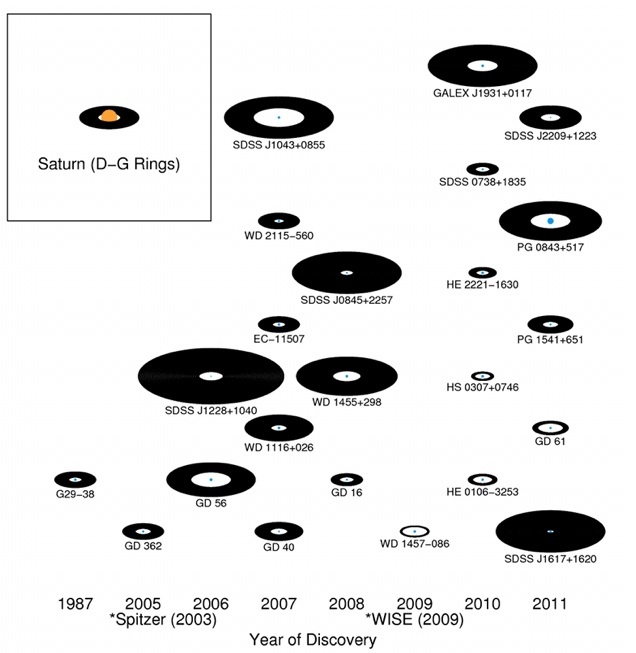 Thanks to many observations of white dwarfs with the Spitzer Space Telescope, WISE, and NASA’s ground-based Infrared Telescope Facility, we have discovered a few dozen dusty white dwarfs in the last 10 years. We believe the dust around these stellar ghosts comes from asteroids kicked too close to the central white dwarf by a larger planet. When this happens, the asteroid shreds apart much like Comet Shoemaker-Levy 9 did when it collided with Jupiter in 1994, and the pieces of it form a disk around the white dwarf. The size of the disk is not much larger than Saturn’s rings. Dust from the disk continues to rain down on the white dwarf surface in the form of atomic gas. Astronomers can measure the composition of this atomic gas—and thereby that of the dust—by taking optical and ultraviolet spectra of the white dwarfs. Just like characters from TV shows like CSI break materials found in a crime scene down to their component elements to identify them, astronomers compare the pattern of elements to Solar System bodies to understand the origin of the dust. Sure enough, they look just like asteroids in our own Solar System. By chasing this elusive dust around dead stars, astronomers are using these clues to piece together the chemical history of terrestrial planet formation around other stars using the shredded remnants of exo-asteroids. The information they gain from studying white dwarfs might be able to tell us whether terrestrial planets have similar properties to our own Earth. Can these white dwarf disks form larger bodies or even second generation planets? Yes, Art, the white dwarf disks might indeed be able to form asteroid-like bodies near their outer edges. The disks John described here are not quite massive enough to form planets. But some white dwarf disks–made of tidally-shredded stars, even tidally-shredded white dwarfs–could be massive enough. Mario Livio and others hypothesized that such planets might be Carbon-Monoxide planets, if they were formed from a tidally-shredded white dwarf.